Without the reality of the resurrection, Christianity is simply another religion. It is the resurrection that validates Jesus’ divine Sonship and demonstrates He is God in the flesh. 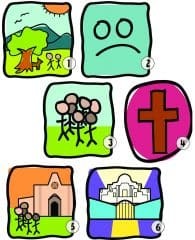 So while it may be difficult for older preschoolers to understand the many deep and challenging theological implications of the resurrection, it is a truth they easily can grasp as children in a way that can settle firmly into their hearts. It is a truth that will help establish the foundation of a growing faith. Children need to believe Jesus is alive, whether they fully understand how that’s possible. The lessons in this unit reveal this core reality. They reveal that Jesus is the central figure of God’s unfolding story, that Jesus is worthy of our love and honor and that He is alive today. Lessons in this unit are listed below. Just click on each lesson title to access the individual lessons. As various parts of God’s unfolding story are studied week by week, these stories need to be seen as essential parts of a unified whole. Periodic reminders of the “big picture” are needed, even for preschoolers. This lesson is one such reminder. On one well-remembered occasion Mary, sister to Martha and Lazarus, expressed her love for Jesus in a particularly grand way. 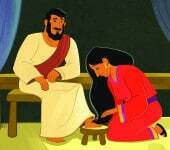 This lesson tells Martha’s story and encourages older preschoolers to express their love for Jesus as well. 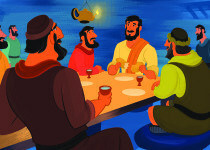 This lesson highlights for older preschoolers the Last Supper—the Passover meal Jesus shared with His disciples that became the first Lord’s Supper. 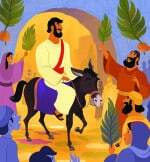 This Palm Sunday lesson examines for older preschoolers Jesus’ triumphal entry into Jerusalem just days before He was crucified. It’s a powerful Palm Sunday lesson. 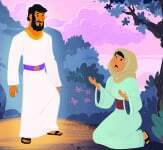 Appropriately, this Easter lesson focuses on Jesus’ resurrection from the dead and highlights Mary’s response when she discovered that Her Master was indeed alive (see John 20:1-18). It also covers the initial discoveries Peter and John made with regard to Jesus’ resurrection.